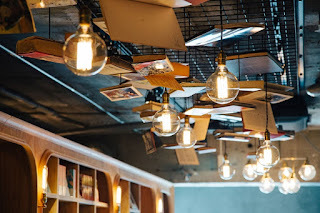 SUSAN ELIA MACNEAL: When I first started out at Jungle Reds, I wrote a post called, Literary Hotels: Would you Stay? 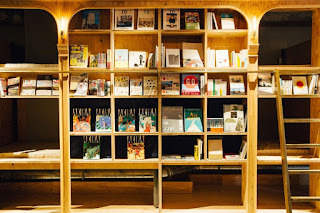 In it, I wrote about the Libary Hotel in New York City; the Sylvia Beach Hotel in Nye, Oregon; and the Akwaaba Inn in D.C.—all book-themed places that look absolutely lovely. 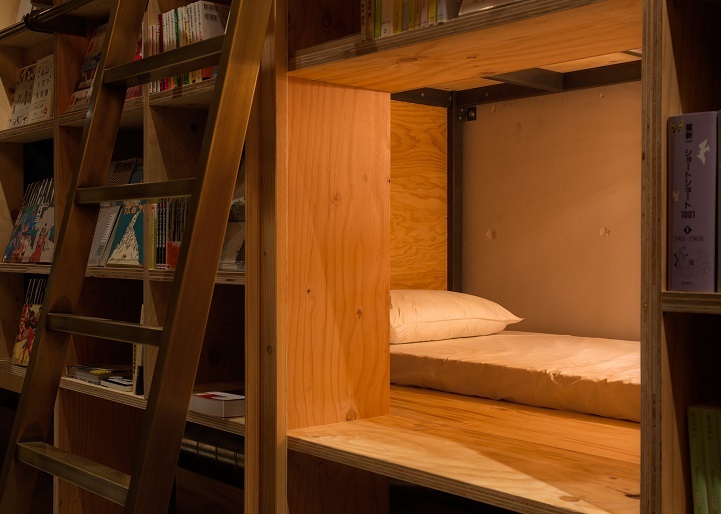 And so when I read about the Book and Bed Hostel in Tokyo, I was intrigued. Now, it's a hostel, not a hotel, so the amenities are different. 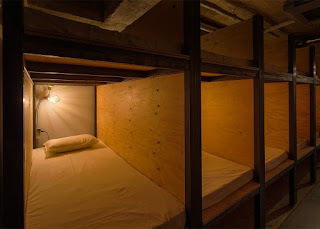 The bed "areas" are small — it's a pod hotel, with bunks rather than rooms per se. There's free wi-fi and shared bathrooms. It costs around $40 per night. 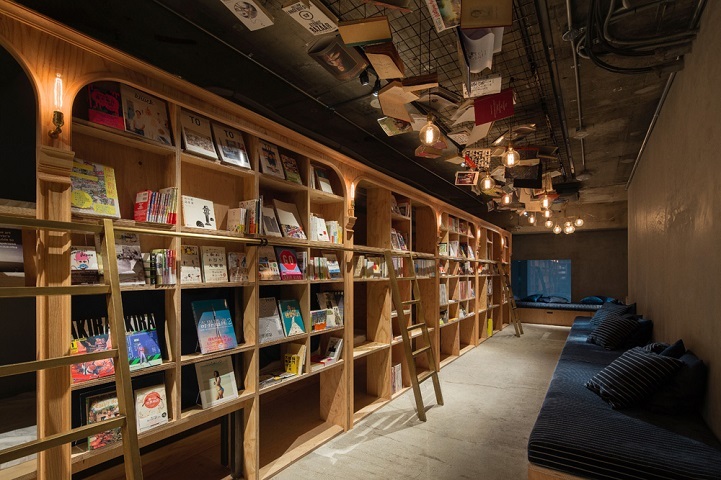 However, the great thing is that it's set up to look like a bookshop. There are lots and lots of books (1,700 in different languages), and you're welcome to take whatever you'd like and read yourself to sleep. Would you stay here? Do you think there's a market for something similar in the U.S.? Tell us in the comments! Well, the books could certainly make up for the lack of amenities [not that I’ve ever chosen a hotel to stay in based on the amenities] . . . but the bed “areas” are a whole different thing -- just looking at those tiny, closed-in beds makes me feel claustrophobic. Maybe I could just sleep on the floor beside all those lovely books . . . . It's a lovely concept, and I can see my twenty-seven year old son staying there, but I'm too old for no locks or privacy. And, like Joan, there's the claustrophobia thing! In my way younger days, maybe. Now? No. I don't do cubicles or shared bathrooms if I don't have to--not even for books! But, that said, I can see the draw. A cozy read in a strange place would be comforting. I'm with Gram. If I want to be literally surrounded by books and share a bathroom I can stay home. I wonder how high off the ground some of those beds are? It looks like there are several levels. I don't "do" ladders! But that's not the only reason I wouldn't go. I need privacy, and my own bathroom! I have stayed at places (summer cottages) that had bookcases filled with books (not knick-knacks, as so many places do) and people were invited to read them, and even to swap out some of their own books for any that they especially liked. One of my favorite places not only had books in each cottage but the owners had a library room in their own house, to which guests were invited to come any time to pick out something to read. There IS coffee and tea in the a.m. -- didn't mention that or put in picture. Like the rest of the posters, I feel like at this stage of life I want a door and a private bathroom... And I know Japan is a safe place compared to the US, but if I were traveling alone, I'd feel weird... But still, it's so cute! And what a great price -- hotels are crazy expensive there. When I went to Tokyo, I was lucky, because Noel was on a business trip — auditioning and training the new Big Bird for Sesame Street Japan! No doors, no locks. It's a library, with places to nap. Oh, sigh, I am getting old. What happened with the Big Bird audition?? Like the rest of you, I'd have done this in my twenties (heck, my freshman year of college I slept in the middle bunk of triple bunk beds). Now, though? Yeah, too old - and I suspect I'm younger than a lot of you. I want doors (I'm not fussy about locks depending on area), my own bathroom, and a bed I don't have to contort myself to get into. Hank's little soaps and other toiletries are appreciated, but not absolutely necessary. The bed doesn't have to be large or even up high, so long as it's clean. The bathroom doesn't have to be fancy, so long as it's private. And, um, yes on a locked door to keep me and my stuff safe. Translation: I'm as old-school in my approach to traveling accommodations as the rest of you. Yeesh! The exception to this, of course, is camping, which I still do sometimes. But not in Tokyo. I'd never get a minute's sleep in a "room" with no door, let alone no locks. I take my own books with me, via the Nook device or reading app. My mind went straight to the poor maids who have to make those darn beds. Struggling with sheets in those closed areas? Yikes. The Big Bird audition was great! We're still friends with a lot of the people we met on that trip, including the guy who got the role of Big Bird and our translator. Can't wait to take Kiddo to Japan -- I think he'll love it. We were there for the cherry blossom festival, too, which was so special. I've also stayed in a book themed B and B but frankly prefer an uncluttered and peaceful room to sleep in. So cute! But... I hate to be so unadventurous--and I'd have done this in my twenties, curled up with my backpack in my bunk. I stayed in lots of B&Bs in the UK that weren't nearly as nice, places with nylon sheets, coin heaters, and really gross shared bathrooms. But, now, I like my privacy. I'm with Reese on the clean and uncluttered, and I really, really want my own bathroom! For all the reasons mentioned above - no. Not even if the place came with cats. My mother-in-law and sister-in-law stayed in one when they were 80 and 55, respectively, on a visit to Denmark. They expected me to join their great adventure which they were famous for. Egypt when it was a bit too exciting... anywhere unwise at the moment. Then they would come home and talk about how exciting it was. They thought I was strange and not living up to my reputation. I reminded them that my reputation was created as a child when I had no sense of danger. I was such a disappointment! I kind of like it! Being in Japan, I don't think I'd worry aboutsomeone bothering me in the space (I assume there re lockers or something for luggage, since there's no room for anything in the bunks.) I've always loved little bed spaces - Nordic closet beds, bunk rooms, etc. 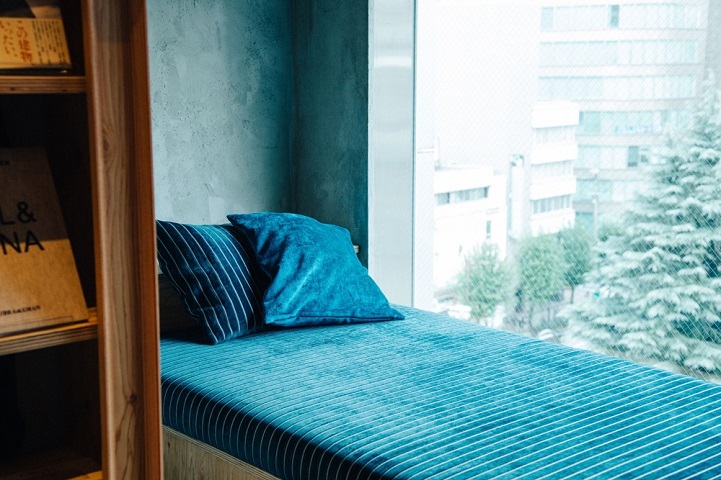 The one thing I would need is sense of privacy, which you could easily do for all the beds shown here by hanging a fitted, heavy curtain in the entrances - you know, like they did in rail berths back in the olden days. I'm with the rest of you who think I'm a bit too old not to have my creature comforts and especially my own bathroom. 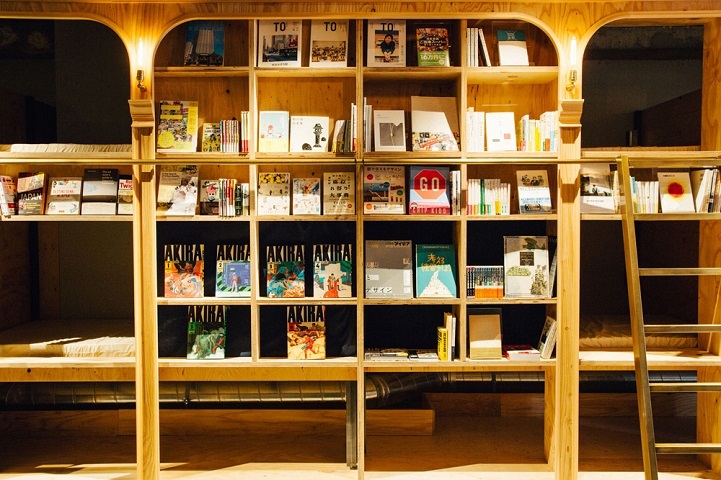 Hostels, even book ones, are a young person's game. My daughter and her then boyfriend (now husband) stayed in some hostels when they were traveling around Europe, but they were 21 years old and traveling with backpacks. The books are a lovely decor, but I always travel with books and my Kindle Fox, so I wouldn't use the service of borrowing them. Ramona, you made me chuckle with your CAT Scan comment. Yes, I sure would stay there. 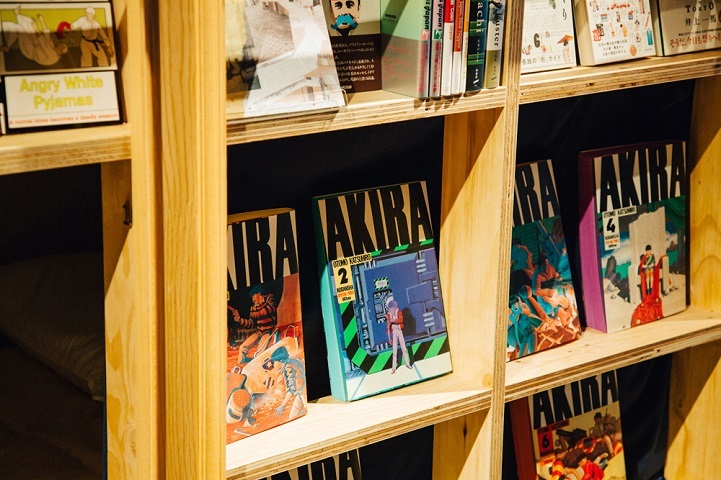 It would be lovely just to touch the spines on the shelf. 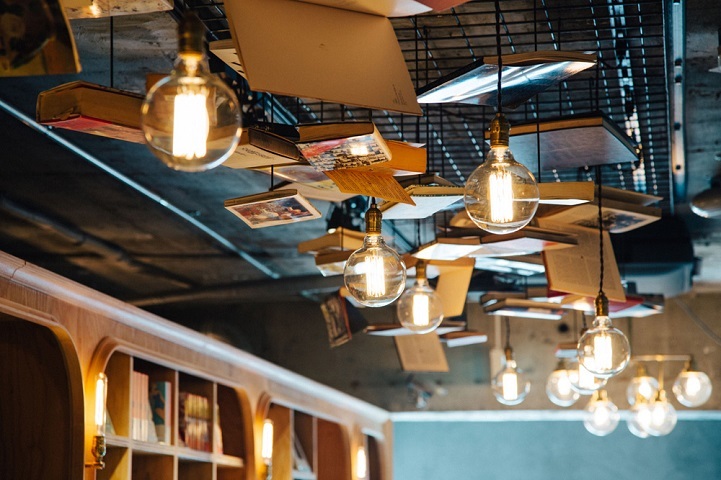 What do you do when you're in the middle of a book and it's time to leave? It's a cute idea, but . . . the tiny enter/exit space for those beds in the middle of all those combustible books would be a fire marshal's nightmare. I remember a problem in some college dorms when students decided to enclose their bunks. Dust allergies would be awful as well. I like the photos though. Not for me, even when I was in my twenties. Looks like having a sleepover with strangers while having an MRI, with possible little critters. I couldn't sleep like that. I appreciate their general idea for those who aren't as picky as I am though. I'd take my own books to bed in a certain cozy, little boutique hotel in South Kensington, London.